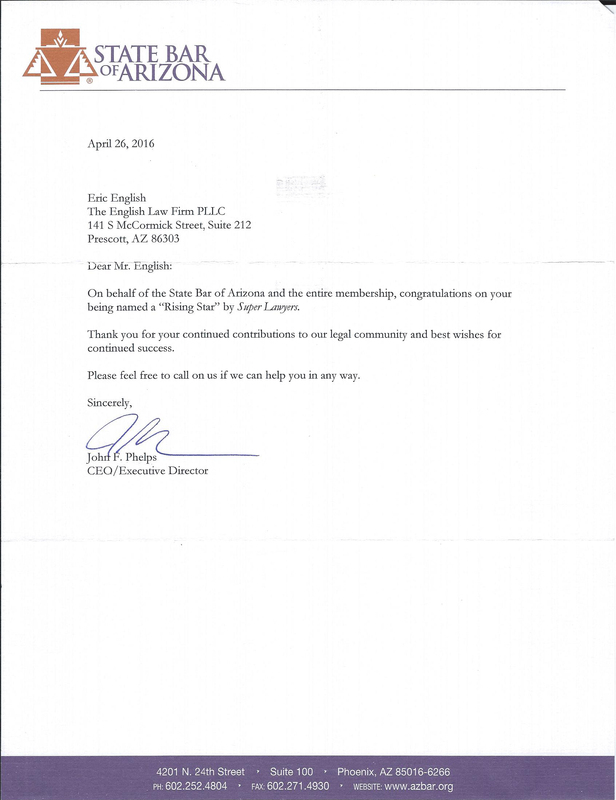 In 2016, Eric English was named a “Rising Star” by Super Lawyers. Only 2.5% of lawyers in the state were selected. Super Lawyers uses a multiphase selection process that includes nominations, independent research and peer evaluations. To be eligible for inclusion in Rising Stars, a candidate must be either 40 years old or younger, or in practice for 10 years of less. It is an honor to be named to the 2016 Southwest Rising Stars. 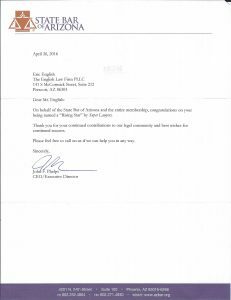 In March 2017, Attorney Eric English was invited to be the legal expert on Independent Talk KFNX 1100 radio show ‘A Call to Rights’ with host Steven Kates. Eric discussed how the right to own animals in Arizona is being infringed upon. Listen to the radio show here. The English Law Firm, PLLC is a full service law firm located in beautiful historic downtown Prescott, Arizona. Copyright © 2015 The English Law Firm, PLLC.